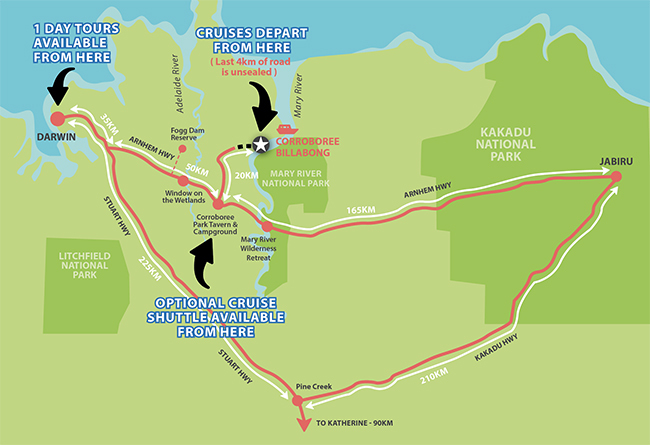 To drive directly to our cruise departure point at Corroboree Billabong takes approximately 90 minutes from Darwin or 2 hours from Jabiru. Travel along the Arnhem Highway to Corroboree Park Tavern which is located 85km from Darwin and 167km from Jabiru. From here it only takes 20 minutes to reach the cruise. If you have not already pre-booked your cruise or transfer, you will need to contact us and make a reservation. 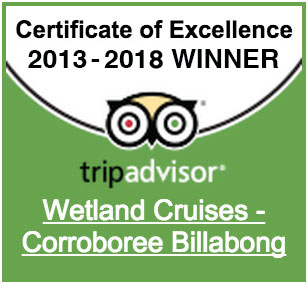 You can call us on (08)89 855 855 between 7.00 am & 5.00 pm or book online 24/7 by visiting our website www.wetlandcruises.com.au .